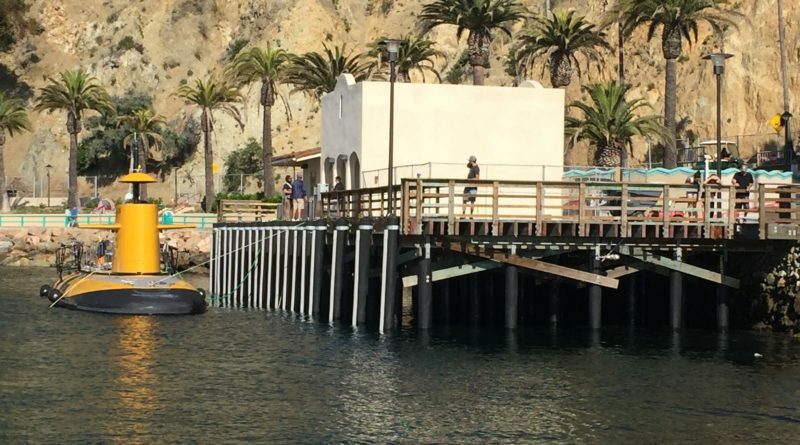 AVALON ― The fuel dock pier in Avalon is open and has been operating since May 13, both Avalon’s City Manager David Jinkens and Harbormaster Brian Bray confirmed. The new restrooms on the pier are open to the public, according to Jinkens. The dinghy dock, however, should be ready in the next couple weeks, Jinkens told The Log on June 2. Bray is hopeful the dinghy dock will be complete by the first of July. “We’re working on the ramp. As soon as that is done, we can install the [dinghy dock], Bray said. The seasonal floating dock, which is made up of two floats and supports the fuel pumps, is still a work in progress. The recently appointed Public Works Director of Avalon, Bob Greenlaw, presented the City Council of Avalon with a request at the June 6 meeting. “Each of those floats has two dispensers on them; they are dual dispensers, so we have four hoses of gasoline,” Greenlaw stated. The Avalon City Council authorized Greenlaw to purchase four gas pumps for the fuel dock in the amount of $88,000. The floats are typically put in seasonally from mid-May to mid-October, Bray explained. The floating dock is 90 percent finished, but the pumps still need to be delivered and installed. Bray is hoping this will be done by mid-July, but admittedly does not know exactly when the floating dock and fuel pumps will be ready for use.